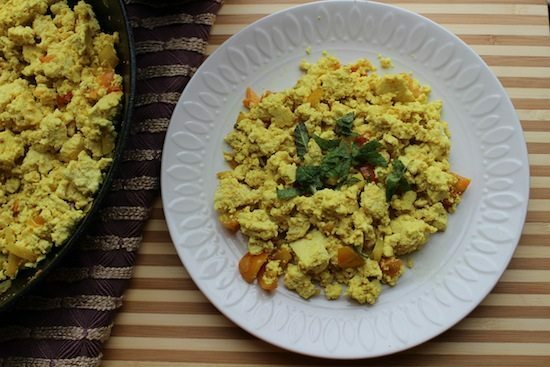 When we say that this is the Best Tofu Scramble Recipe, we mean it! You can use it in so many different ways. Enjoy it on its own or try it in other recipes like our Chiles Rellenos Tofu Scramble or our Vegan Breakfast Burrito. Totally delish. 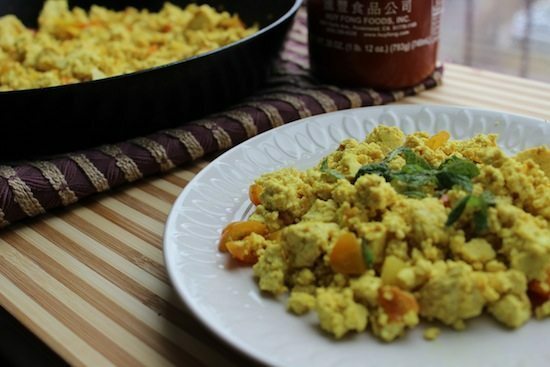 Tofu tends to have a meat like texture that many people like and is great to mimic the texture of scrambled eggs. Tofu is also a phenomenal source of protein that is made from curdled soy milk that the water has been removed from. Soy provides a healthy dose of calcium and manganese and many studies have found that the phytoestrogens in soy may help to reduce some cancers such as breast cancer or endometrial cancers and reduce the risk of heart disease. Who doesn’t like the sound of that? First, you will to start with a block of tofu. Drain the tofu and pat it dry with some towels, ensuring that all the moisture is out so that you get the right texture. Cut the tofu into inch sized cubes and have some fun mushing it into a scrambled egg like texture. Throw that scramble into a bowl and set it aside. In a pan, heat the vegetable oil for a minute on a low-medium flame. Add some curry or turmeric powder and heat with the oil for a minute to dissolve the powder in the oil. Add in your onions and garlic and saute with the spices. Add the chopped tomatoes and saute for another couple of minutes. Finally, toss in that scramble and mix all together for another 6-8 minutes. Sprinkle a bit of salt and pepper to taste and enjoy! 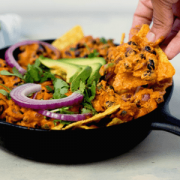 The best part of this recipe is that you can add almost anything you would like to it. Looking for some more protein? Throw in some beans. Trying to squeeze more veggies in your day? Toss in some peppers and greens. Want to use up those extra herbs before they go bad? Scatter in some cilantro or parsley. How would you prep this scramble to make it uniquely your own? Let us know what you think in the comments below! Drain the tofu, and pat it dry with some paper towels. Cut it into inch size cubes, and then simply mush the tofu with your hands making a scrambly texture. When all of the tofu is manually scrambled, insert in bowl and set aside. In a pan, heat vegetable oil for one minute under low-medium flame. Add curry or turmeric powder. Let it heat for a minute so the oil can dissolve with the powder. Add in onions and garlic, and sauté with the curry/turmeric. Add in chopped tomatoes and sauté for 2-3 minutes. Lastly, add in the crumbled tofu. Mix all ingredients together, and allow to cook for 6-8 minutes on low flame. Top with salt and pepper, to taste. Optional: You can add 1 tablespoon of nutritional yeast to finished product for flavor and color. What kind of tofu would you suggest using? Thanks! I stumbled upon your site, and I think you are both lovely! I love how you approach food clean eating, living! truly an inspiration and the bonus is it’s all so pretty! thanks so much!! You guys will probably hear from me a lot, I am still on track with my commitment to stick with my goals and trying you guys recipes and others from the suggested links are THE BOMB !! We went out to one of our favorite restaurants and I usually don’t eat the Tofu when I bring it home due to the texture, to me. This morning I used the Tofu and make this recipe, I loved it. 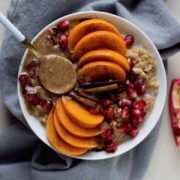 Looking forward to trying out the meals on your 14-day plan!! that is amazing! and thank you so much for the love! so awesome you’re trying new things. I forgot to ask is there a way to edit recipes on your page? I can make changes to the recipe after it is saved to Yumprint. Not that we know of! Sorry! !